The Bruins will take on the 2-2 Carolina Hurricanes tonight at 7. The Bruins are looking to improve to 4-0-1 on the season. Both teams have scored 2.75 goals per game, while the Bruins have only allowed 2 per game, compared to the 3.25 that the Hurricanes have allowed. However, we only average 29 shots per game, where they average 39. This is better for our percentages, but tough when we have Anton Khudobin making his first start of the season. He started one game for us last season and only allowed 1 goal while recording 44 saves. He has only played in 7 career games. Gregory Cambell, David Krejci, Milan Lucic, Brad Marchand, and Rookie Dougie Hamilton are all tied for the team lead with 3 points. 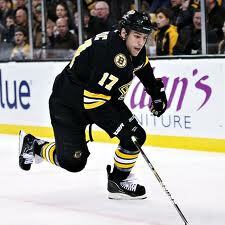 Lucic is the leader with 3 goals and penalty minutes with 17. This fits right in with the Bruins model ever since the won the Cup 2 years ago. There is no clear-cut star on this season. It could have been Savard before he got concussed, but now there is no one. Just a team that’s willing to do whatever it takes to get the W. I love that hockey’s back. This entry was posted in Bruins and tagged boston, boston sports blog, bruins, carolina, Chara, hockey, hurricanes, lucic, nhl, seguin, stanley cup by christoph131. Bookmark the permalink.